Just found this Pegasus Toys ad, which comes from Pony Magazine December 1961. I'm sorry about the yellow stripe. My scanner, which is pretty ancient, has now decided everything needs a yellow stripe, no matter what I do. I really like this Pegasus model: it's much more delicate than the Julips, which love them though I do, are on the clumpy side. The hound's rather gorgeous too. It's a pity Isis and Pegasus became defunct. It would be interesting to know if the moulds still exist, as I think they're much more attractive than Julips and surely there would be an opportunity there for someone prepared to make the investment. 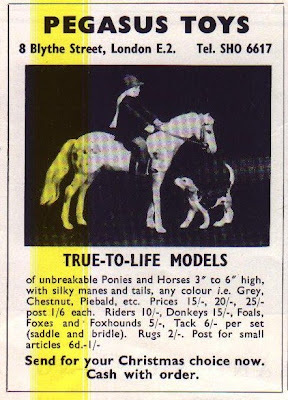 I blogged a while back about model ponies in the mid 1960s, but have since bought a load of Pony and Riding magazines from the early 1960s, which are wonderful source material for so much that I would like to write about but have not had time. 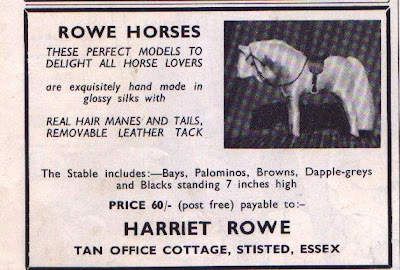 The magazines have adverts for a whole range of model horses most of whom were defunct by the mid 1960s. 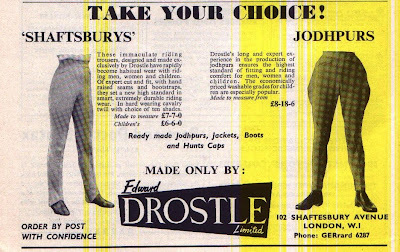 As I was born in 1962, none of these ever swum across my ken, none were dandled over my pram to amuse or even bought in by an enterprising parent for Jane to have later. Ah well. As ever with this blog, I've nearly made posts on several subjects, but then life has got in the way, and my great thoughts have fizzled. Anyway, inspired by this post on Musings, here is an observation. I wonder when other people find that instead of introducing your children to music (other than being hit over the metaphorical head with the Thomas the Tank Engine theme tune, which counts as torture), that they start introducing it to you? Son, like the rest of his family, was a bit credit-crunched when Christmas came round, so made us all CDs. So unlike my own teenage days, when you would tape things off the Top 40 show, finger hovering over the pause button so you got as much of the track as possible before the dj starting talking. So here are the Verve. Thanks Fred.